You are here: Home > Great Ideas Shared from R&R Readers! Our community is known for our natural wildlife. We offer a beautiful, fully stocked catch and release pond that houses ducks, geese and cranes. 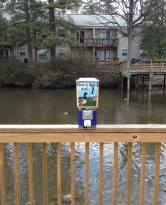 This year I purchased a duck feeder for $200 that my maintenance team installed on our fishing deck. Residents have really enjoyed the experience of feeding our ducks every day. In addition to offering this great amenity, this has turned in to a better profit than we could have imagined. The cost to purchase one bag of cracked corn is $15.00. We can refill the feeder 10 times on that one bag. Each refill of the feeder generates roughly $40 in quarters. I would say this investment paid for itself and continues to be a crowd-pleaser with our residents. I purchased the duck feeder from Gumball Machine Warehouse online for only $114. This book is kept in the leasing area. 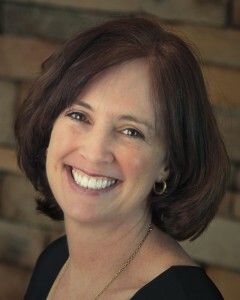 Prospects will read about what the community offers as a whole. We did a 10 Things I Love About Yo0 for one of our models also. We put the apartment number at the top and the floor plan number so when they look back at it after they are home, they have all the facts in front of them to make a decision. The book makes it easier than trying to remember details after seeing 5 apartment communities :). Giving a new resident a fun and creative gift can be challenging. You have a tight budget to adhere to and you need to stand out among the competition. 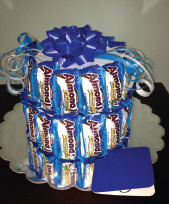 Why not make a candy bar cake to leave in the apartment for your new resident. They cost about $5.00 each and take roughly 15 minutes to make. I chose Almond Joy for 2 reasons. 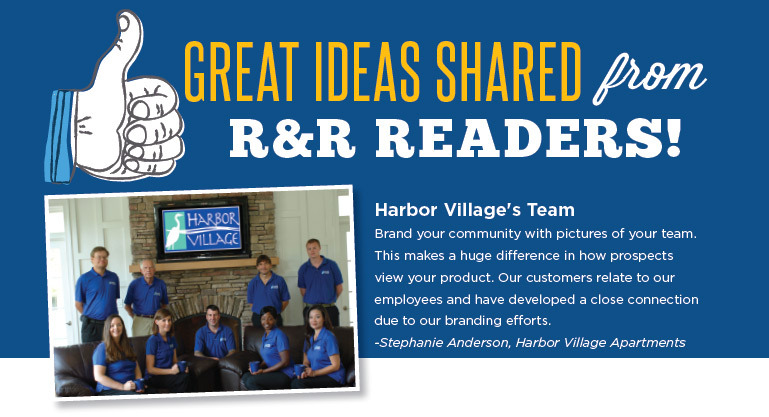 The first is that it matches our colors at Harbor Village which all goes back to our branding strategy. Second, I created a catchy slogan for the welcome card that says “It’s a JOY to welcome you to Harbor Village!” It’s also a practical gift since you can eat the contents. Life Got Sweeter! For our candy theme month. 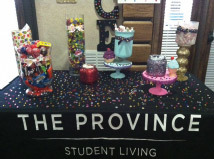 “Life just got sweeter living at The Province! 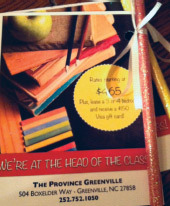 Rates starting at $465!” We went to Walmart and purchased about $100 in candy and candy containers. Anyone who toured (or came in the office) loved having candy there. It put a smile on their face even before they toured! We had promo items (koozies, pens, notepads) available to grab. Anyone who toured during a certain 2 weeks (campus orientation weeks) during our candy theme was entered into a drawing to to win a tablet. We’re at the Head of the Class! Sprout Marketing created the flyers for us and I took it a step further and attached a glittery pencil (from Michael’s) to each & every flyer. We’re student housing so this caught their eye! They loved it!!! Fantastic summer event! We hid pink flamingos all over the community. 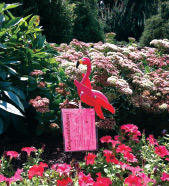 Residents who found the flamingo (and the Congratulations coupon hanging around its neck) received a prize! 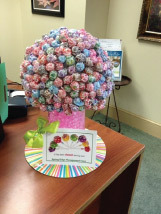 Wanted to share the lollipop tree that Famata Moore (Assistant Manager of Spring Ridge Apts) put together for Resident Appreciation Month. 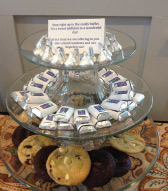 Residents loved coming in and picking up a treat as they paid their rent or put in a work order. It’s a fun and cheap way to show your residents that you appreciate them. This is perfect for the properties that do not have a community room. Total cost for lollipop, vase, styrofoam ball, ribbon, and water beads was $27 at Michael’s! During the summer I selected a winner from whoever Liked our “Who Is Ready To Be Poolside?” post on FB. Winner received a bag of promo items. Residents and prospects loved it!